My oldest daughter had an ice show this past weekend and, since I was in charge of the raffle table, I had to do some last-second running on Friday. I figured I would need something quick to eat for lunch and picked up this product. When I first saw this at the store, I was skeptical about it. It was nearly $1 more than a normal noodle cup and I was doubtful the quality would be good enough to justify the extra money. As it turns out, when I made this on Friday, I quickly discovered I was right. First of all, the cover on the cup is very deceiving. 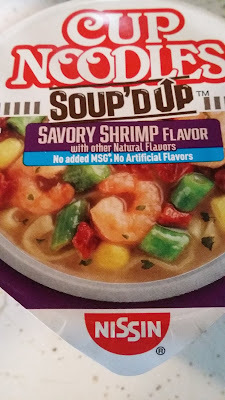 It makes it look as though there is more shrimp/vegetables than you would get with a normal cup noodle product. That, however, really wasn't the case. 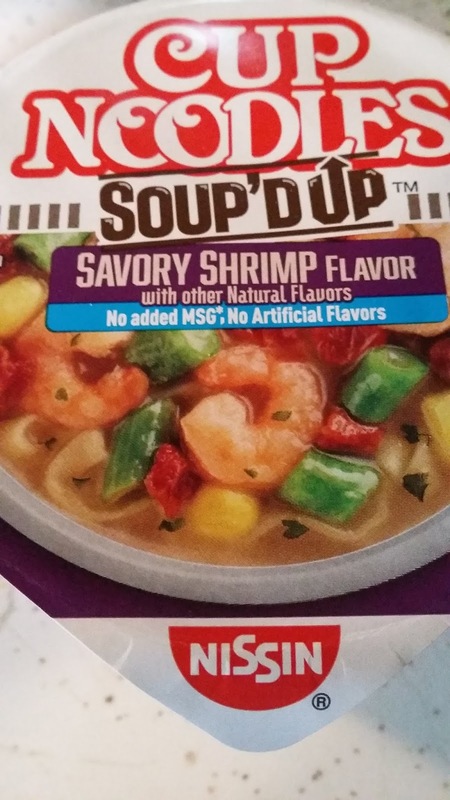 I only found 3 1/2 shrimp in my cup and didn't notice any significant difference in the quantity of vegetables. When it came to flavor, I will admit I do think this was slightly better than the 48-cent cup noodles I normally buy. However, it wasn't enough of a difference to make me think "wow, these are awesome!" And, I do still think the overall product fell short of what it was advertising. Final Opinion: I didn't hate it. But, I also didn't think it was worth the extra money. I wouldn't purchase it again as a result.